When Captain John Rumford, USMC, stands up for the dead Marines of Iwo Jima against the forces of political correctness that have invaded his beloved Corps, he is promptly cashiered for his trouble. But upon his return to his native Maine, he discovers that even in the countryside, there is no escaping the political correctness that has spread throughout the United States of America. And when what begins as a small effort by some former Marines to help fellow Christians in Boston free themselves from the plague of crime in their neighborhoods turns into a larger resistance movement, Captain Rumford unexpectedly finds himself leading his fellow revolutionaries into combat against an ideological enemy that takes many different forms. 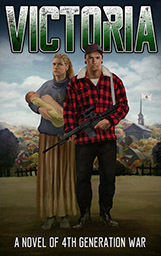 Victoria: A Novel of 4th Generation War is a vision of an American restoration. For some it will be seen as a poignant dream, for others, a horrific nightmare. But Victoria is more than a conventional novel and involves more than mere entertainment. In much the same way Atlas Shrugged was the dramatization of a particular philosophical perspective, Victoria is the dramatization of a new form of modern war that is taking shape as the state gradually loses its four-century monopoly on violence. It is a book that informs, even teaches, through example. And sometimes, the lessons are very harsh indeed. EPUB and MOBI for Kindle. No DRM. 473 pages. Also available on Amazon and Amazon UK. CH is ahead of the curve. Keep up the excellent work. OK. Maybe I’m missing it but, who is the author? Yes author please. What about sample? 1st chapter, etc. Purchasing from amazon won’t get you the freebie. Have you checked the box to get on the New Book Release mailing list? Re: Dave. Yes I’m on the mailing list. Place me on the mail list. Having paid for the book, when and how does it arrive? Is there a download page, a link mailed? Perhaps I messed up the secret handshake; life is full of mystery.